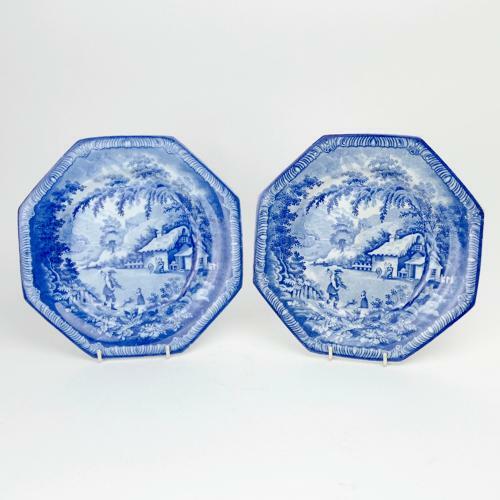 A pair of blue and white, transfer printed plates. One of the plates is marked 'BRAMELD + I' and the other is marked 'BRAMELD' within a cartouche of flowers. Both marks are impressed and they are the marks of the Rockingham Works in Yorkshire. They date from c.1820. The transfer prints are very good quality and they show a woodcutter returning to a cottage. The transfer design fills most of the octagonal plate and there is just a narrow border. The plates are pearlware, both with a blue tint to the glaze, but the one is much bluer than the other, indicating more cobalt in the glaze. They are both in excellent condition.